Missed the first part of this story? Check it out here. I was doing my best to forget that we were traveling basically one day behind my MIL and her friend (M) during our honeymoon, but occasionally Eric would tease that he saw them in the villages we toured. I laughed it off as a total impossibility--what were the chances? We hadn't coordinated our schedules any further than a general location and had no idea which days we'd be in which cities. So when half-way through our day in Siena E was convinced he saw his mom's friend I slapped him and told him to stop kidding around and just enjoy the day. But walked up closer to the steps at the baptistery to get a closer look. Sure enough, there was M and my MIL on an audio walking tour not 100 feet in front of us. 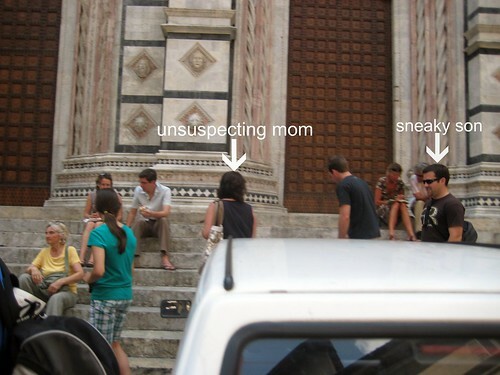 I was anxious and would have probably rather just pretended not to see them, when Eric got this idea to go surprise her. And not in a good way. Let's take a look at that a little closer, shall we? 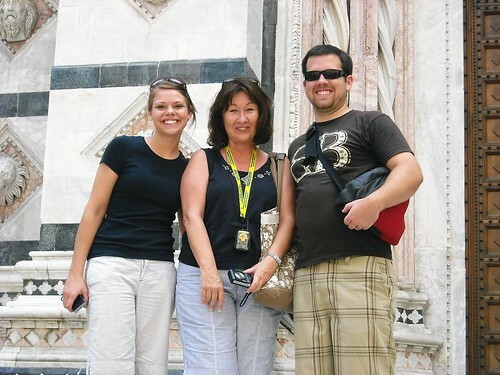 Yes, my husband snatched his mother's purse in a busy town in Italy. But before she realized who her purse snatcher was, she screamed bloody murder, and afterwards was so shook up (from surprise at seeing us as well as being 'robbed') I felt really bad! I don't think E did, though. Because they were on a guided tour, we had only enough time to ask how things were going, take a photo together, and be on our way. We didn't see them again after that, but I have to admit it was strange to come home and compare pictures of the exact same places on the same days--our honeymoon vs. their vacation. But from now on, we're calling travel 'dibs' first! If you went on your honeymoon to the same location at the Inlaw's vacation, would you change your plans? Ask them to change theirs? You are a great photo taker. I love your MIL's face in the purse snatching photo! That's a priceless shot. But glad to know it sounds like the MIL was not expecting to see you guys either. And seriously, what are the chances of running into your MIL?! Crazy, right? Hilarious! I could not travel with my MIL. We have totally different styles!! But always fun to surprise people! My parents and my in-laws all went to Florida with us for our honeymoon. Maybe our honeymoon wasn't as big of a deal for us since we were already living together but we wanted to celebrate with our family. We definitely set aside alone time. Both families were great! They went off and did their own thing while Hubs and I did ours. I think it was the best of both worlds because we had our alone, intimate time and we had fun family bonding time. Side note- Our families get along great! They are talking about another joint vacation in the future. Hubs and I feel very blessed about this. Omg I would have been so scared, but it is funny. I could definitely understand how it would seem weird to be sort of same place at the same time. Especially when you just want to get away from everything and everyone on your honeymoon. I am loving reading your honeymoon recaps! Keep up the great work :o) I am taking notes for my own honeymoon in october.